When it's time to buy a leg of Iberico ham or a shoulder for a family celebration or a party, we often realize we don't really know the difference between ham and shoulder! What's the difference, and which is best? Find out below! 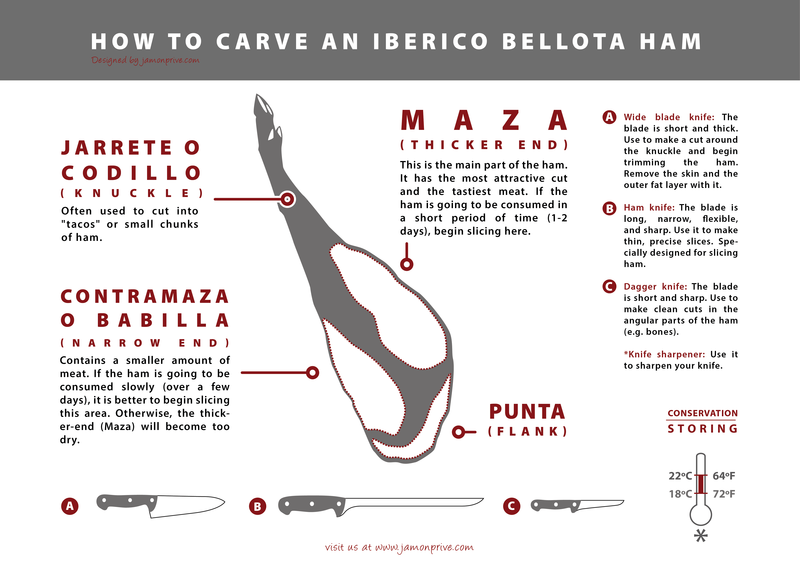 If you're unfamiliar with Iberico ham the differences between shoulder and Iberico ham may seem subtle but they're very important. Both pieces undergo a similar curing process and they're from the same pigs, but because they're based on different cuts of pork they behave differently both under the knife and on the tongue, and each has distinct characteristics. It's best to understand the organoleptic qualities and the differences in weight and composition between the two types of piece before you make your decision. Then you can buy based on your tastes or on your guests. 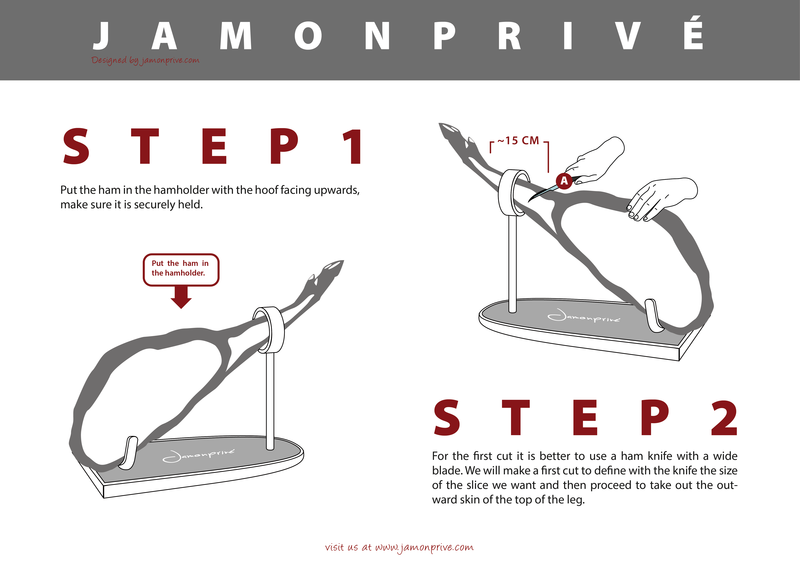 Iberico pigs are quadrapedal and thus each limb is large enough to be useful for eating. However, the front legs are not just two more rear legs in a different place: they are articulated differently and contain different bones and muscles so their products are also different. The front legs are both shorter and smaller than the back legs, and thus shoulder is a smaller product than Iberico ham. In both size and weight, there are several important differences between shoulder and Iberico ham. As the forelegs are shorter and lighter so too is shoulder compared to Iberico ham. When you buy it, the average shoulder will be about 60 to 75cm long and rather lighter than the average Iberico ham. Typically, a ham will be about 70-90cm long and heavier and broader than a shoulder. Because of the distribution of the bones throughout each piece, especially the presence of the shoulder blade in a shoulder, there is usually more meat on an Iberico ham too. Another difference between shoulder and Iberico ham is the shape. This is largely dictated by the arrangement of the bones of the peice. In a shoulder, the presence of the large, flat shoulder blade contributes to a broad, flattened shape that has a 'paddle-like' appearance while Spanish hams are more rounded as well as being heavier. The above-described differences are important, but they are not crucial from the standpoint of the palate. In fact, flavor, aroma, texture and visual appearance, grouped together under the banner of "organoleptic qualities," form the main difference between shoulder and Iberico ham. many expert tasters believe that shoulder is the tastier meat of the two, partly because it contains more fat which is vital as an influence on flavor and texture, and partly because it's usually cured for a shorter time, giving a "younger," more piquant flavor. However, both have their partisans and Iberico ham has a unique and powerful flavor of its own Iberico hams are hung for longer than shoulders, which produces a more nuanced flavor with a balance between its disparate elements. You'll find tones of spices as well as the Spanish ham flavors you'd expect, all influenced by the acorns in the pigs' diets, in a good Iberico ham. By contrast, shoulder has a more direct, less subtle flavor. Both are somewhat difficult to describe and are better tasted than heard or read about! Obviously the facts raised above will form part of the basis for your decision. Beyond the qualities in each product that are subjective, there are some matters that are purely objective and factual and these should be factored into your thinking too. One of these directly affects your pocket: Iberico ham is typically more expensive per kilo than shoulder because of the greater expense incurred by its longer curing period. However, an Iberico ham will take longer to eat too! A general rule that will help you figure out which product best suits your needs is that, kilo for kilo, an Iberico ham costs about twice as much as shoulder, when we're talking about products of equivalent quality. If your Iberico ham and shoulder both come from pigs with the same degree of Iberico ancestry and that have beed reared and fattened on the same diet, this rule usually holds true. It should be noted, though, that the two products are on average different weights, with Iberico hams typically weighing in at about 7.5kg while a shoulder usually weighs about 5kg. When combined with the fact that a shoulder will typically contain a higher amount of bone than an Iberico ham, this means that a shoulder is ideal for occasions when they will be eaten all at once, while a ham can usually be made to last longer or to serve a larger number of guests. If the party you're planning is a very large affair, an Iberico ham might work out as the more economical choice overall. Regardless of the exterior differences between shoulder and Iberico ham, what matters is your own subjective taste: if the palate is satisfied, all else is by the wayside!